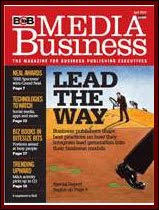 Praetorian Group CEO Alex Ford was quoted in a recent cover story for BtoB Magazine about lead generation. In the article, he touches on the challenges of dealing with customers whose primary method for evaluation is leads, and how we've had to educate them on the bigger picture of sponsorship. “We've stayed away from cost-per-lead and cost-per-click programs,” says Alex. “A lot of the companies we work with say they're only measuring online advertising by the number of sales leads they get. If we're working off that metric, how do we value everything else we're doing?"